YUN-FEI JI The Scholars Flee In Horror, 2006. Mineral pigments and ink on mulberry paper, 40 5/8 X 72 1/4 inches. YUN-FEI JI Below the 143 Meter Watermark, 2006. Mineral pigments and ink on mulberry paper, 118 1/2 X 56 1/8 inches. YUN-FEI JI Last Days Before The Flood, 2006. Mineral pigments and ink on mulberry paper, 75 1/2 X 70 inches. 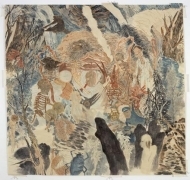 YUN-FEI JI Nine Women, 2006. Mineral pigments and ink on mulberry paper, 24 1/2 X 54 1/2 inches. YUN-FEI JI The Dead Can Still Dance, 2006. Mineral pigments and ink on mulberry paper, 36 1/2 X 38 inches. YUN-FEI JI Passage, 2006. Mineral pigments and ink on mulberry paper, 51 3/4 X 38 inches. YUN-FEI JI The Loudspeaker's Song, 2006. Mineral pigments and ink on mulberry paper, 43 1/2 X 26 inches. YUN-FEI JI A Dead Water Buffalo, 2006. Mineral pigments and ink on mulberry paper, 26 3/8 X 48 inches. YUN-FEI JI Fragments of Abandoned Houses Near Feng Jie, 2006. Mineral pigments and ink on mulberry paper, 42 1/4 X 34 1/2 inches. YUN-FEI JI Six Men and Two Women, 2006. Mineral pigments and ink on mulberry paper, 23 1/2 X 52 1/4 inches. YUN-FEI JI A Strong Wind, 2006. Mineral pigments and ink on mulberry paper, 34 3/4 X 37 3/4 inches. James Cohan Gallery is pleased to announce an exhibition of new works by expatriate Chinese painter, Yun-Fei Ji, opening November 16th and running through December 22nd. This will be Ji's first solo exhibition at the gallery. Yun-Fei Ji was raised in China during the Cultural Revolution, a fact that fuels his exploration of Chinese contemporary history and directs his critical eye on issues of modernization. The title of the exhibition, "Water That Floats the Boat Can Also Sink It," is a Chinese proverb that for Ji reflects the dark-side of development. The conflicting forces of water as provider and destroyer have been an essential theme for the artist. 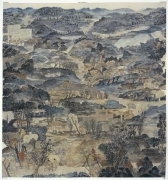 The Three Gorges Dam and the devastation it has caused throughout the Yangtze Valley, including the displacement of over 1.5 million people from their ancestral homes, have been subject matter for Ji's allegorical paintings for a number of years. In this body of new works, the dam becomes the backdrop as Ji explores the cultural and psychological effects of the flooding on the rapidly changing fabric of Chinese life. At first glance, the works appear to be traditional Chinese scroll paintings, but on a closer inspection, we are confronted with the less-serene depictions of homelessness and disaster. Yun-Fei Ji populates his richly textured landscapes with vignettes of village life in deep distress. We observe supernatural encounters with ghosts haunting the once densely populated valley, fleeing peasants scurrying through the demolished villages with their belongings on their back, and corrupt party officials flaunting their machismo while trying to find their role in the new China. Real life and fictional narrative collide, creating a dizzying array of historic and futuristic encounters. Monumental in scale, Ji's new paintings are his largest to date. The tallest vertical painting, Below the 143 Meter Watermark, is 118 inches high and has a stacked perspective that is densely filled with multiple layers of imagery. Water Rising is a long horizontal scroll diptych with the left panel (unframed) 208 1/8 inches and the right panel (unframed) 241 7/8 inches. This diptych is hung on two perpendicular walls with the panels meeting in the corner of the gallery. The figures in the left panel of this cinematic drama are running toward the figures in the right panel as if they are due to collide with each other- they are fleeing with nowhere to go. 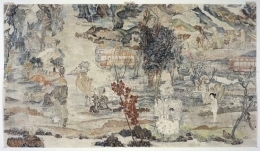 Yun-Fei Ji's new body of work was completed while in residence at the American Academy in Rome on a Prix de Rome fellowship this exhibitions year. Ji first came to the United States on a Fulbright scholarship in 1985. exhibitionsly, he is living in London as an artist-in-residence at Parasol Unit, Foundation for Contemporary Art. In 2005, Ji had the honor of being artist-in-residence at Yale University where he was able to conduct extensive research with the help of scholars from a wide range of departments. Ji's most recent solo museum exhibition in 2004, "The Empty City" originated at the Contemporary Art Museum, St. Louis and went on to tour nationally at venues including the Rose Museum, Brandeis University, and the Peeler Art Center, DePauw University. 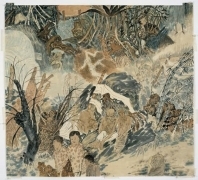 In 2004, the exhibition "Yun-Fei Ji: The East Wind" was organized at the ICA, University of Pennsylvania. Ji's work has been exhibited in solo and group shows throughout the United States and Europe including the Whitney Biennial 2002.